A multi-award winning holiday park and one of the best Caravan Parks Albury NSW has to offer for fun, family holidays. Great Aussie Holiday Park rests on the banks of Lake Hume, and is one of the best caravan parks Albury NSW has to offer. 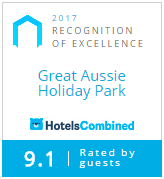 Our award-winning holiday park is located near Albury Wodonga and we are your complete adventure playground. Everything we do is designed to give you the best family holiday experience in Australia. Our holiday park has lots of activities for kids and a great water spray park. Great Aussie Holiday Park is one of the most spacious caravan parks Albury NSW has. We have two kilometres of private foreshore on the banks of Lake Hume, plus a boat ramp. Our caravan park has dog friendly camping. Melanie and Russell Diffey are proud owners of Great Aussie Holiday Park. We are members of Top Parks and The Australian Camps Association. Away from the hustle and bustle of urban sprawl, this holiday park epitomised what a great holiday adventure entails; expanses of water, curious birdlife, rolling hills and ever-helpful staff with comfortable accommodation. This is such a great family park. We stayed with the extended family, some of us camped in tents, and others had cabins. There were so many other families with kids, we virtually didn’t see our kids, as they were always off at the playground, jumping pillow and water park. We have a beautiful cabin with a great view. Very clean and comfortable. Spacious grounds and great playground for children and bush walks. There are rustic cabins, modern cabins, camp sites, caravan sites.